Other nations have several possible ‘tracks’ to follow, and when they get an objective in one of the tracks, then they are provided with another. 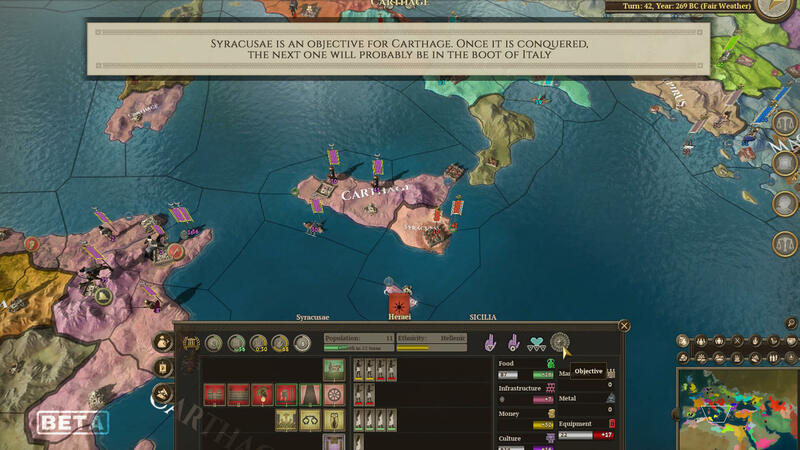 For example, Rome has a track that represents its progress against Carthage, including Spain and Africa. Another track will let the Republic fight Epirus, Macedon and then go to Asia Minor, and so on. Another possible approach to gaining Legacy is to make your regions very cultured, so that they produce legacy points by themselves. There are two levels here, and both demand substantial investment in the right buildings and decisions with the second level being quite a challenge to achieve. But if you devote your nation to the creation of prestigious buildings, it’s a possibility. Yet another option is to pursue actively those national decisions that provide Legacy Points. These can include domestic reforms, or mounting a far away expedition to the border of the known world. A final way to generate legacy is to try enduring the difficulty of managing a nation past its glory. Like Sparta perhaps, that clung to life for centuries well beyond its climax. This has no doubt left a lasting impression to the future generations, as few people know nothing about Sparta, even nowadays. 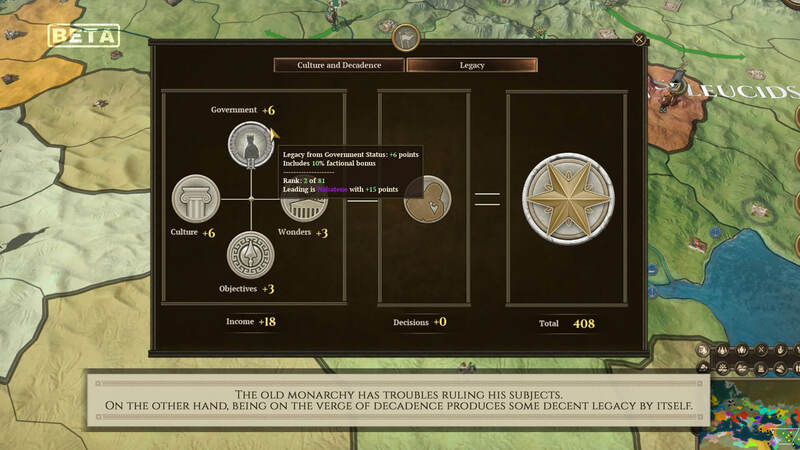 Practically speaking, when your government is old or decadent, each turn you manage to survive the vicissitudes happening to your nation, then a significant amount of Legacy Points will be given. 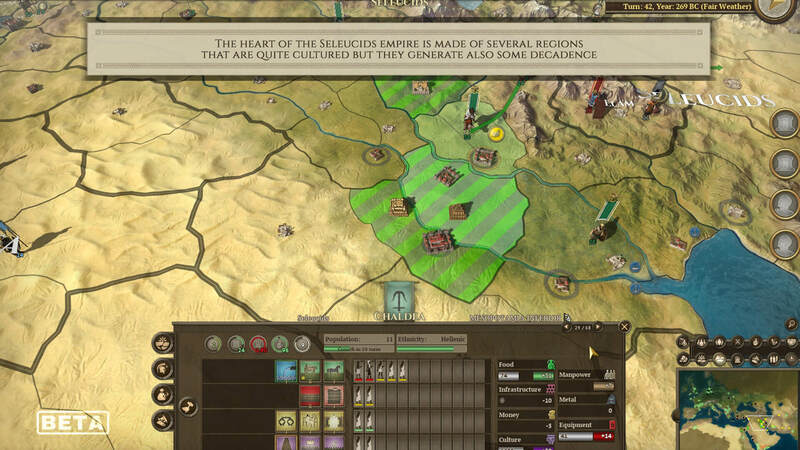 If you can build, and sustain, a substantial legacy lead it is possible to win the game before its actual end-date of 190 CE. This might reward a high risk strategy where you try to gain legacy quickly and accept the inevitable problems such a focus will bring. A modern equivalent of the traditional Spartan instruction to ‘return with your shield or on it’? 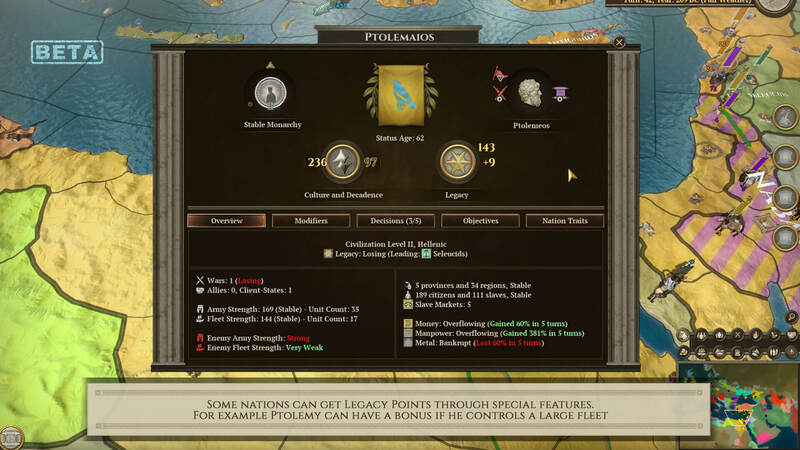 Equally possessing substantial amounts of legacy will help you during the game as there are a number of rewards to being seen as an impressive state by your contemporaries. So the game is much more about painting the map in your color. Even if in the end all nations are trying to generate more legacy than their rivals, you can still get these points from different approaches, although admittedly it is probably better to try a balanced approach perhaps with a focus on one.